Some people buy clothes, crafts or nicknacks as souvenirs when they travel. I like to buy food! I recognized the casserole on the front as Pastitsio – the Greek equivalent of lasagna made with thin tube pasta, meaty sauce and a fluffy topping. So I bought a box. It wasn’t until I got home and honestly tried to make this that I realized all the instructions were in Greek. 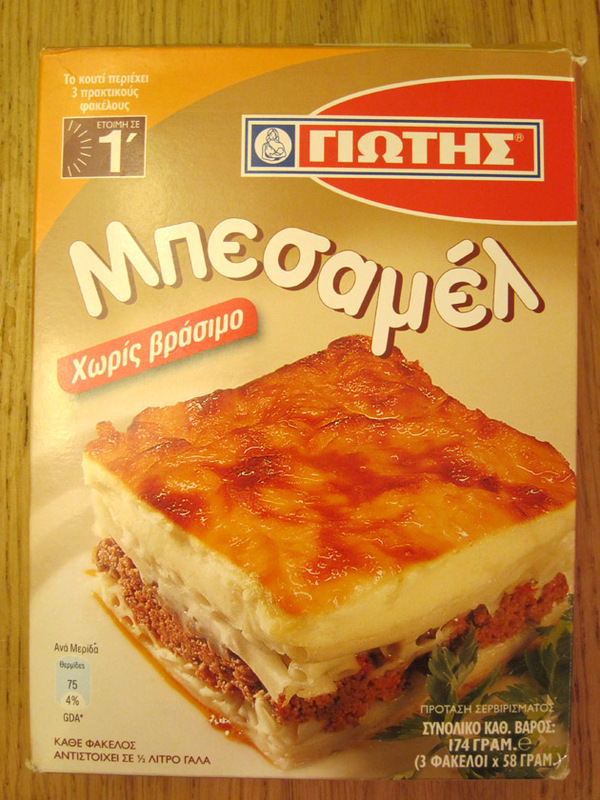 Apparently I had purchased a box of instant bechamel sauce that can be used for a variety of Greek dishes. After some time on Google Translate I figured out how to prepare the powdered mix. [FYI, Ρίχνουμε σε ένα μεγάλο μπολ, 1,5 λίτρων (7,5 φλιτζάνια) κρύο γάλα = Pour into a large bowl, 1.5 liter (7.5 cups) cold milk.] 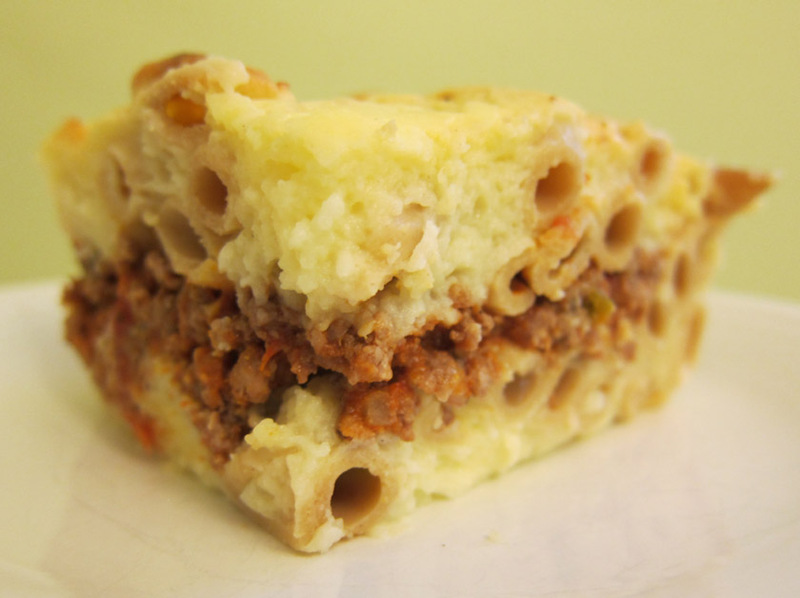 I then found a translated recipe on the company’s website for Pastitsio which is below (with my tweeks). This is actually a delicious meal that I completely encourage people to try. To prepare it, you will either have to make your own bechamel sauce or impulse buy random cooking items while traveling in Greece! Καλή όρεξη! Boil the macaroni for 15 minutes. Drain, rinse with cold water and set aside until you prepare the meat. In a saucepan, add the oil, meat, salt, pepper, cinnamon and nutmeg. Sauté for 15 minutes and then pour in the tomato sauce and let simmer for half an hour. In the meantime prepare the bechamel according to package directions. Add the cheese and stir. Oil the bottom of a large, deep baking dished and lay half the macaroni along the bottom. Put the meat on top and cover with remaining macaroni. Cover the entire surface with the remaining Bechamel and sprinkle with a little melted butter and a little Parmesan. Cook the pie at 180C/350F for 1 hour. What kind of cheese do they use in Greece? There was a spectrum of soft/crumbly and mild/salty cheeses. For the dish I just used mozzarella since a mild cheese is probably best.